Today (July 10) was a good day. I woke up early to see the Confederate flag being lowered as the result of the miraculous gesture of forgiveness. 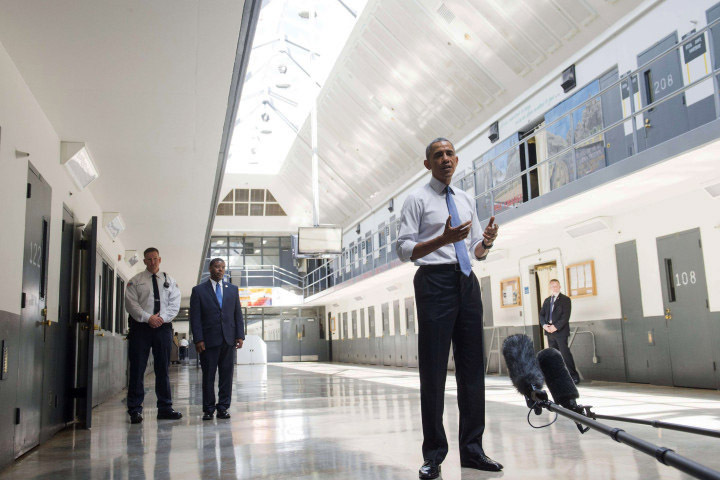 Later in the day I learned President Obama will be visiting El Reno, an Oklahoma prison. I couldn’t help but hope that the miracle of forgiveness would last more than one day, and that its miraculous value was potent enough to shatter the misconception that punishment actually works. I have been excited all day by the notion of forgiveness as a healing remedy. A remedy that would cure short-sightedness, thirst for revenge and the insanity reflected in meaningless repetition expecting different results – the imprisonment of millions. I am filled with hope that President Obama will lay out a new vision. His visit could be the greatest honor in some people’s lives and the first time a major politician has come to see about the status of prisoners. This is a big deal since he is visiting while the issue of mass incarceration is currently such a large part of the public discourse. However, in spite of my gratitude that for the first time a sitting president has decided to visit a medium level prison and my effort to remain optimistic about his visits, there is a historical and political context for me. It is this reality that binds me, like the shackles I once wore. I have been to prison and have witnessed enough dignitaries paraded through to know that what he will be shown will be orchestrated and who he will be allowed to talk to will be choreographed. Significant parts of prison reality cannot be seen in single day. He will not see people growing old during the course of a single day; he will not see life slipping away. He will not be able to see Black boys growing into old Black men. He will not know about all the graduations, weddings and funerals missed. Significant parts of prison reality cannot be seen in single day. He will not be able to see Black boys growing into old Black men. This kind of pain and those tears are hidden from everyone but one’s closest comrades, the ones willing to share their last Snicker candy bar and willing to bleed for the guy in the next cage. He will not be allowed to talk to the older, politically conscious prisoners whose politics usually have them confined in level four prisons and, in some instances, led to their incarceration. We have abandoned some of our elders like old out-of-style clothes and friends we no longer want to see. He will not get the honor of meeting incarcerated leaders who resisted the abhorrent conditions of their confinement through work stoppages and hunger strikes. Nor will he be able to see or hear the screams of the people driven insane by the experience of this thoroughly broken system. He will not get the honor of meeting incarcerated leaders who resisted the abhorrent conditions of their confinement through work stoppages and hunger strikes. Nor will he be able to see or hear the screams of the people driven insane by the experience of this thoroughly broken system. If he does lay out a new vision, I hope it will include the people walking out of the doors of jails and the gates of prisons. Every year a small army is released from incarceration across the United States, and approximately two-thirds are doomed to failure. I can’t count the number of times I have spoken to old friends who were unable to stay out of the clutches of the criminal justice system. I walked the yard with too many of them trying to extract whatever bit of information I could use to make my freedom bid more successful. Too many times I was told that crime was not a first choice but a last option that stood between them and hunger, homelessness and pain. These old friends made me acutely aware of the role that structural discrimination played in their failure and helped me to view it in a more holistic way as a societal failure. As a society, we lack the vision and analysis to incorporate the rehabilitation of incarcerated people with the rehabilitation of the marginalized communities where they lived and were arrested. There is no real commitment to the community or to the people destined to live there upon release. Over the course of the last three decades we never thought about training and employing incarcerated people to rebuild places like Detroit and Baltimore. There has been no real effort to inspire a captured people and to enter into a social contract for reentry that would serve their interest as well as that of public safety. As a society, we lack the vision and analysis to incorporate the rehabilitation of incarcerated people with the rehabilitation of the marginalized communities where they lived and were arrested. We never thought about training and employing incarcerated people to rebuild places like Detroit and Baltimore. We have not only missed the opportunity to rebuild communities – we have also missed the opportunity to restore and rebuild families. We have relied too heavily on the notion of personal responsibility at the expense of our collective responsibility and obligations. Maybe this time our president will learn that there is a major difference between “won’t pay” child support and “can’t pay” child support, and we can stop punishing people who are unable to provide. Families are already devastated enough – nearly half of imprisoned Black fathers were living with their children at the time of their capture. We have wasted enough money to have done and gotten better. The addiction to punishment makes us believe that we can secure genuine public safety through application of force and fear. But force and fear have always been better suited for torture and oppression than for forgiveness and rehabilitation. Recently, formerly incarcerated leaders have been knocking on the doors of the White House, the Justice Department and the Department of Labor, and our primary focus has been on employment rights. We have been pursuing an executive order to Ban the Box for private contractors doing business with the federal government. Banning the box would delay the question about conviction history until an applicant receives a conditional offer of employment, making the initial hiring process more open and fair for all. Employers would save money by avoiding background checks on people not sincerely being considered for the job. Banning the box would delay the question about conviction history until an applicant receives a conditional offer of employment, making the initial hiring process more open and fair for all. Marginalized communities are losing upwards of $65 billion in revenue as a result of “the box” and other structural discrimination. We are aware that federal contractors and subcontractors oversee approximately 30 million jobs and that many of these jobs are paid for with our tax dollars. Current policy demanding immediate disclosure of conviction history keeps these jobs out of reach for millions of formerly incarcerated people. While this unfair and ugly practice is devastating to those with arrest and conviction histories, the impact goes beyond that. It also functions to keep entire families and communities mired in poverty. Marginalized communities are losing upwards of $65 billion in revenue as a result of this kind of structural discrimination. Over the course of the last several years we have pursued Ban the Box in both blue states and red states. We have banned the box in 17 states, in over a hundred cities and counties, and in some of the largest corporations in America. Our effort has enjoyed the support of both Democrats and Republicans but more importantly the emergence of formerly incarcerated people who demand the right to speak in their own voice. These formerly incarcerated people are not looking down at their shoes – but unapologetically demand the full restoration of their civil and human rights. We knocked on the doors of our federal government with a solid track record of hard work and meaningful results. Over a 100 million people now live in a jurisdiction where the box has been banned in some form or another. The American criminal justice system has been and continues to be fraught by racism. People of color in general and Black people in particular are being stopped, detained, questioned, arrested, convicted and sentenced more often than whites. The collateral consequences of this process mean that we are unable to fairly compete for employment because of a conviction history – or the assumption of having one, based on race. If Black lives actually matter, then this covert form of racism and discrimination must be stamped out. Although I believe in miracles, it would be a long reach for one visit from a sitting president to offset the daily bombardment of “reality” police and prison shows. The media has a fundamental responsibility of promoting public safety and should be admonished for instead promoting and advancing current day prejudice and fear. As stated earlier, I believe in miracles, and I also believe that the pen is mightier than the sword. This president has the ability to help level the playing field by issuing a presidential memorandum and an executive order banning the box for private contractors. He can instruct the government about their employment policies, and he can impose demands on the people with whom the government does business. This president has the ability to help level the playing field by issuing a presidential memorandum and an executive order banning the box for private contractors. He can instruct the government about their employment policies, and he can impose demands on the people with whom the government does business. I will certainly be listening for what he has to say. I am hoping he can see the massive waste of human potential and that he will figure out the people occupying those cells could be an asset instead of a liability. I hope that he will see them as human beings. Jobs are the fastest way to slow down the revolving prison doors and to stop crime and bullets. No matter where I set the bar in an effort to manage my expectations for this visit, that bar has been forged and shaped by white supremacy. It took over 54 years to take down the Confederate battle flag, a flag used to champion the cause of slavery. It is from and into this environment that the first sitting Black president will walk into a prison system that has absorbed a number of old plantations. Today was a good one, as distinguished from a long line of days where hopeful possibilities were unimaginable. We should all be so lucky as to be touched by forgiveness and grace. Mr. President, I still have hope. Dorsey Nunn, who was himself formerly incarcerated, is executive director of Legal Services for Prisoners with Children and a founder of All of Us or None, an activist organization for formerly incarcerated people. He can be reached at dorsey@prisonerswithchildren.org or at LSPC, 1540 Market St., Suite 490, San Francisco, CA 94102, 415-255-7036. This entry was posted on Wednesday, September 2nd, 2015 at 9:16 pm	and is filed under Other Articles. You can follow any responses to this entry through the RSS 2.0 feed. Responses are currently closed, but you can trackback from your own site.